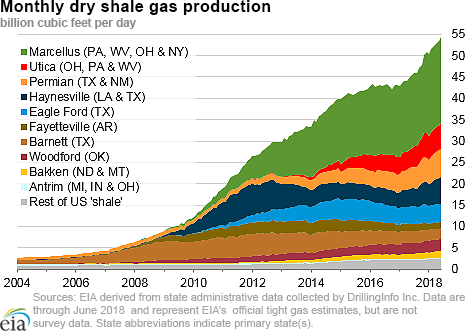 In June 2018, natural gas production in the Haynesville shale formation, located in northeastern Texas and Louisiana, averaged 6.35 billion cubic feet per day (Bcf/d), accounting for 8.5% of the total U.S. dry natural gas production, Haynesville’s highest production level since November 2012. The Haynesville formation lies deep underground between 10,500 feet and 13,500 feet. In comparison, the depth of the Marcellus shale ranges between 4,000 feet and 8,500 feet. This depth makes drilling costs in the Haynesville shale generally higher than other shale plays. However, breakeven costs have decreased in recent years, making Haynesville natural gas economic at its current prices. During 2013, when Henry Hub prices averaged $3.80 per million British thermal units (MMBtu), an average of 45 rigs operated in the Haynesville, which was the second-largest producing shale gas basin after the Marcellus. The rig count increased to 51 rigs in 2014 as Henry Hub prices increased to $4.87/MMBtu. However, when the number of rigs decreased as the Henry Hub price declined, Haynesville reached a low of 20 rigs in operation in 2016. 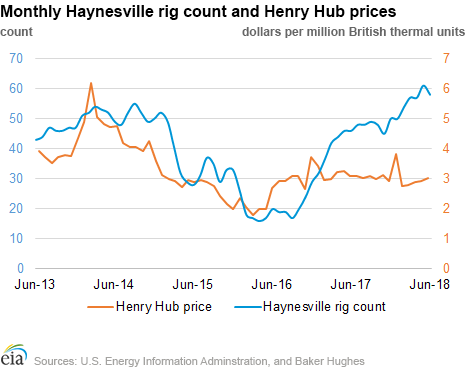 Since then, the Haynesville rig count has steadily increased as Henry Hub prices have remained at or near $3.00/MMBtu. 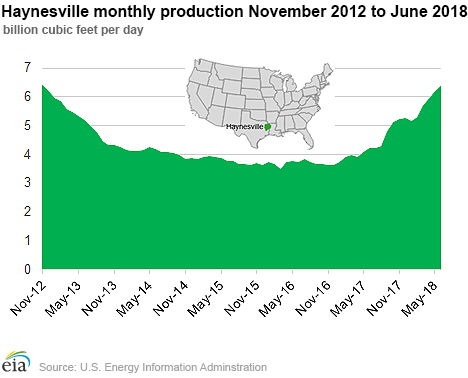 Dry natural gas production in the Haynesville formation in June 2018 was 23% higher than the production level in June 2013—a new five-year high. In addition to the higher rig count, improvements in well productivity has occurred. 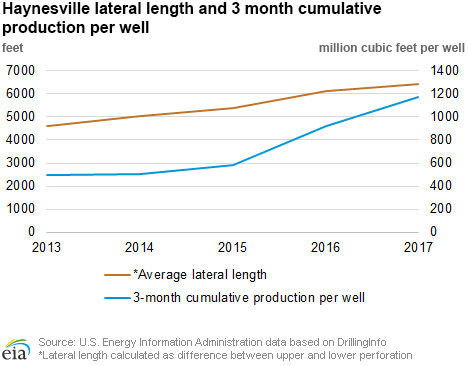 Both the average lateral length and initial productivity (IP) rates per well in the Haynesville increased between 2013 and 2017. Lateral lengths have increased steadily from 4,603 feet to 6,421 feet, according to DrillingInfo, while the initial three-month cumulative production per well increased from 496 million cubic feet (MMcf) in 2013 to 1176 MMcf in 2017. Productivity gains are expected to continue as producers optimize natural gas recovery from the Haynesville formation. Natural gas spot prices rose at most locations this report week (Wednesday, August 1 to Wednesday, August 8). 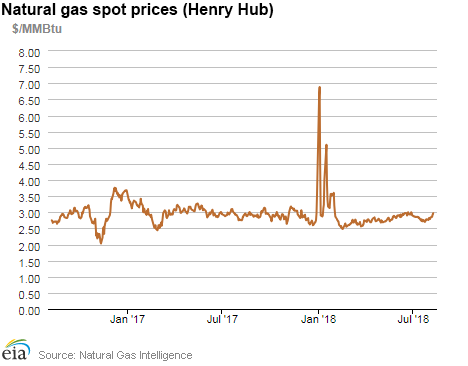 Henry Hub spot prices rose from $2.80/MMBtu last Wednesday to $2.97/MMBtu yesterday. At the New York Mercantile Exchange (Nymex), the September 2018 contract price rose 19¢ from $2.758/MMBtu last Wednesday to $2.949/MMBtu yesterday. Net injections to working gas totaled 46 billion cubic feet (Bcf) for the week ending August 3. Working natural gas stocks are 2,354 Bcf, which is 22% lower than the year-ago level and 20% lower than the five-year (2013–17) average for this week. 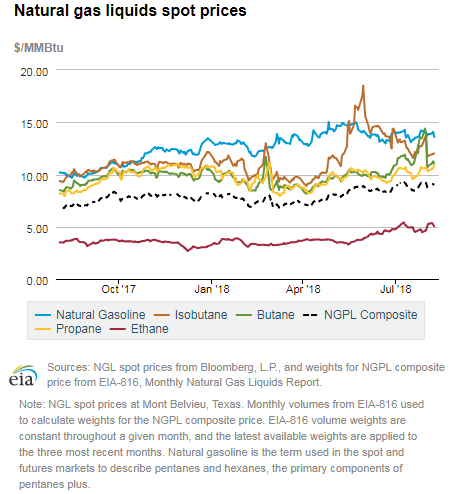 The natural gas plant liquids composite price at Mont Belvieu, Texas, fell by 8¢, averaging $9.00/MMBtu for the week ending August 8. The price of natural gasoline and propane both fell by 1% while the prices of butane and isobutane fell by 16% and 8%, respectively. The price of ethane rose by 11%. 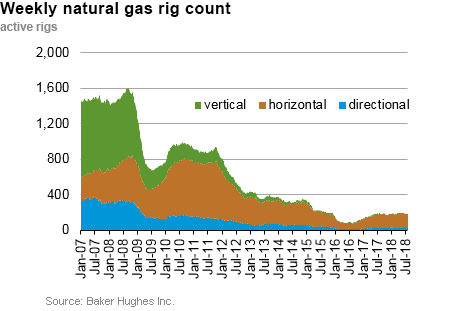 According to Baker Hughes, for the week ending Tuesday, July 31, the natural gas rig count decreased by 3 to 183. The number of oil-directed rigs fell by 2 to 859. The total rig count decreased by 4, and it now stands at 1,044. Prices rise at most locations. This report week (Wednesday, August 1 to Wednesday, August 8), Henry Hub spot prices rose 17¢ from $2.80/MMBtu last Wednesday to $2.97/MMBtu yesterday as temperatures increased in the South. At the Chicago Citygate, prices increased 28¢ from $2.73/MMBtu last Wednesday to $3.01/MMBtu yesterday, as temperatures also increased in the Midwest. Prices at PG&E Citygate in Northern California rose 24¢, up from $3.21/MMBtu last Wednesday to $3.45/MMBtu yesterday. Prices at SoCal Citygate remained high amid continued supply constraints and temperature-driven demand, increasing from $9.74/MMBtu last Wednesday to $14.17/MMBtu yesterday with a high of $26.55/MMBtu on Monday. Prices at the Waha Hub in West Texas, which is located near Permian Basin production activities, averaged $2.23/MMBtu last Wednesday, 57¢ lower than Henry Hub prices. Yesterday, prices at the Waha Hub averaged $2.10/MMBtu, 87¢ lower than Henry Hub prices. Northeast prices increase. Prices in the Northeast increased with warmer temperatures on Monday and Tuesday. At the Algonquin Citygate, which serves Boston-area consumers, prices went up 18¢ from $3.08/MMBtu last Wednesday to $3.26/MMBtu yesterday, with a high of $3.76/MMBtu on Monday. At the Transcontinental Pipeline Zone 6 trading point for New York City, prices increased 15¢ from $2.92/MMBtu last Wednesday to $3.07/MMBtu yesterday, with a high of $3.47/MMBtu on Monday. Tennessee Zone 4 Marcellus spot prices were constant week over week at $2.45/MMBtu. Prices at Dominion South in southwest Pennsylvania rose 6¢ from $2.53/MMBtu last Wednesday to $2.59/MMBtu yesterday. Nymex prices rise. At the Nymex, the price of the September 2018 contract increased 19¢, from $2.758/MMBtu last Wednesday to $2.949/MMBtu yesterday. This is the highest the front-month contract has been since the end of June. The price of the 12-month strip averaging September 2018 through August 2019 futures contracts climbed 14¢ to $2.894/MMBtu. Supply remains flat. 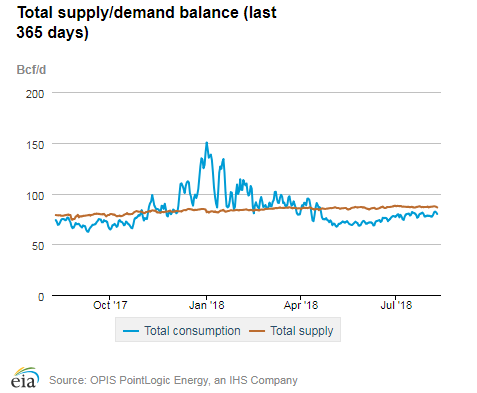 According to data from PointLogic Energy, the average total supply of natural gas remained the same as in the previous report week, averaging 87.1 Bcf/d. Dry natural gas production remained constant week over week; however, the average dry natural gas production during the report week, 81.4 Bcf/d, is 11% higher than last year’s level at this time. Average net imports from Canada increased by 1% from last week. EIA’s most recent Short-Term Energy Outlook forecasts that 2018 will have 11 consecutive months of record dry natural gas production (February–December), growing to more than 83 Bcf/d by the end of 2018. Demand rises. Total U.S. consumption of natural gas rose by 1% compared with the previous report week according to data from PointLogic Energy. Natural gas consumed for power generation climbed by 6% week over week as temperatures generally warmed across the United States. Industrial sector consumption stayed constant, averaging 19.8 Bcf/d. In the residential and commercial sectors, consumption declined by 14% but remains a relatively minor contribution to total demand during the summer months. Natural gas exports to Mexico increased 3%. According to Genscape, flows on the El Encino-Topolobampo pipeline segment increased over the past few days. U.S. liquefied natural gas (LNG) exports decrease week over week. Five LNG vessels (combined LNG-carrying capacity 18 Bcf) departed the United States from August 2 through August 8 (four from the Sabine Pass liquefaction terminal and one from Cove Point). Two LNG tankers (combined capacity 7.1 Bcf) were loading on Wednesday, one at Sabine Pass and one at Cove Point. Net injections are lower than the five-year average for the sixth week in a row. Net injections into storage totaled 46 Bcf for the week ending August 3, compared with the five-year (2013–17) average net injections of 53 Bcf and last year's net injections of 29 Bcf during the same week. Working gas stocks totaled 2,354 Bcf, which is 572 Bcf lower than the five-year average and 671 Bcf lower than last year at this time. Working gas stocks are below the five-year range for the second week in a row. The average rate of net injections into storage is 18% lower than the five-year average so far in the 2018 refill season. If working gas stocks match the five-year average rate of injections of 10.0 Bcf/d for the remainder of the refill season, inventories will total 3,243 Bcf on October 31, which is 317 Bcf lower than the five-year low of 3,560 Bcf. In the Lower 48 states, total working gas stocks are currently 16 Bcf and 58 Bcf lower than the five-year range in the East and Midwest regions, respectively. The South Central region posted working gas stocks that are 46 Bcf higher than the bottom of the five-year range, with the nonsalt facilities 46 Bcf higher than its lower bound. Total working gas stocks in the Lower 48 states are now 57 Bcf below the five-year range. Despite historically low storage inventories, the average January 2019 futures contract price trades at a lower premium to the average spot price than last year at this time. Price differences between the spot price and the futures prices at the Nymex indicate limited economic incentives for net injections into working gas. 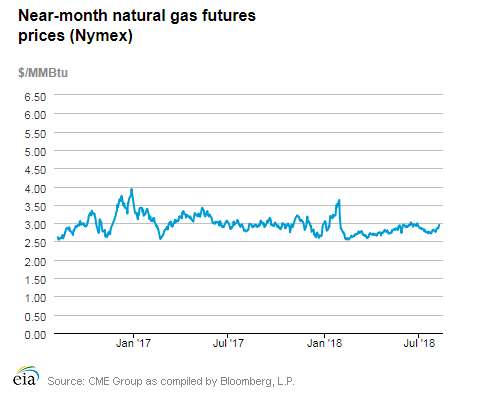 During the most recent storage week, the natural gas spot price at the Henry Hub averaged $2.79/MMBtu while the Nymex futures price of natural gas for delivery in January 2019 averaged $3.04/MMBtu, 25¢/MMBtu higher than the spot price. Last year at this time, the January contract was 39¢/MMBtu higher than the spot price. Reported net injections into storage are close to the median of the range of analysts’ expections. According to The Desk survey of natural gas analysts, estimates of the weekly net change from working natural gas storage ranged from net injections of 41 Bcf to 52 Bcf, with a median estimate of 47 Bcf. At the 10:30 a.m. release of the Weekly Natural Gas Storage Report (WNGSR), the price of the Nymex futures contract for September delivery at the Henry Hub remained relatively unchanged at $2.95/MMBtu, with only 10 trades executed. Trading activity increased shortly thereafter, but the price remained close to $2.95/MMBtu. Temperatures are in the higher-than-normal range for the storage week. Temperatures in the Lower 48 states averaged 76 degrees Fahrenheit (°F), 1°F higher than normal and 1°F higher than last year at this time. Temperatures were 1°F lower than the level reported for the previous week.